“Over the past few years, SCOR has ramped up its commitment to climate risk management, playing an active role in various sector-specific and multi-sector climate-related initiatives. These have included the French Business Climate Pledge signed in the wake of the Paris Climate Agreement, the Geneva Association’s Climate Risk Statement on Climate Resilience and Adaptation, and more recently the Decarbonize Europe Manifesto and the Letter from global investors urging governments of the G20 nations to fully support and implement the Paris Agreement. Following the Group’s announcement in 2015 of its full divestment from companies deriving more than 50% of their revenue from coal, SCOR made two further pledges. First, in 2017, it undertook to divest from the shares of companies deriving more than 30% of their revenue from coal. Then, in 2018, it extended its coal divestment strategy by adopting the Global Coal Exit List. The Group now holds no investments in the top 120 developers of coal-fired power plants on this list, and has pledged to make no further investments in these companies in the future. SCOR’s environmental and social commitment has also prompted it to implement broader initiatives designed to protect all populations from disease and addiction. The Group has contributed to the wide-ranging debate over whether climate change is likely to affect the well-being, health and mortality of populations, and whether it is likely to have an impact of the risk of pandemics. In May 2017, SCOR announced its full divestment from tobacco companies. In September 2018, the Group committed to an international initiative vis à vis the UNEP FI, as a founding member of the Tobacco-Free Finance Pledge. This initiative aims to raise awareness and encourage financial institutions to consider their business commitments with the tobacco industry, from the perspective of the global tobacco epidemic. 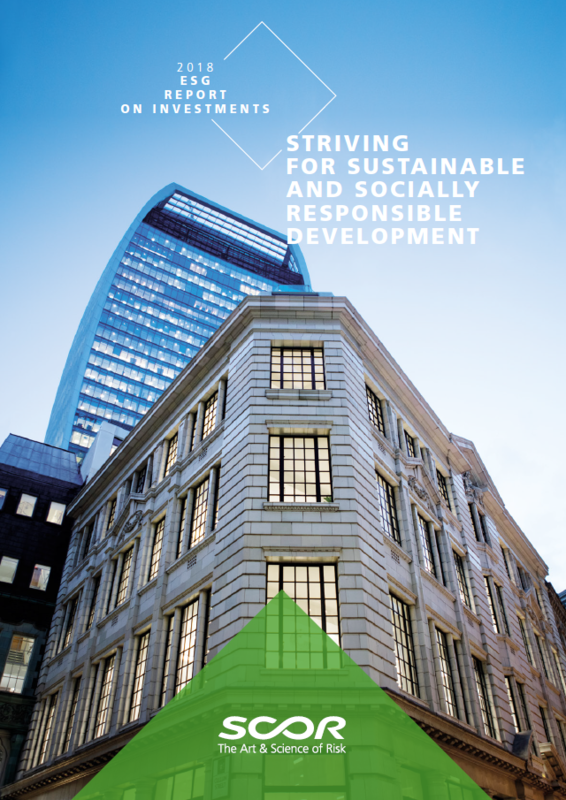 With this commitment, which confirms SCOR’s position as a responsible Life & Health reinsurer, the Group has demonstrated that the investment community can play a role in support of the common good. SCOR’s environmental and social commitment is reflected in its strong support for scientific research. The Group strives to deepen and share insights into the main climate and pandemic risks threatening the world. The SCOR Foundation for Science, established in 2011, bears witness to the Group’s long-term commitment to creating and disseminating risk awareness. In 2018, the Foundation supported an exhibition and seminar at the French natural history museum, called “Meteorites, From Sky to Earth”. It also co-organized an international conference on emerging infections and pandemic risk with the Institut Pasteur in June 2018. This event brought together some of the world’s leading specialists in infectious diseases to consider how epidemics spread. SCOR réaffirme son indépendance et prend acte de la décision de Covéa de retirer sa proposition sur un éventuel rapprochement. Contrairement à ce qui est affirmé, SCOR n’a eu aucune discussion avec Partner Re, ni avec aucune autre société.